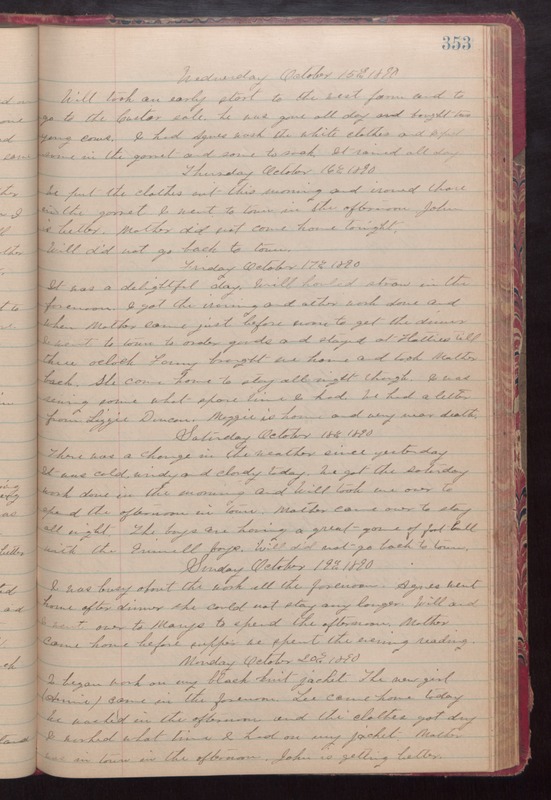 Wednesday October 15th 1890 Will took an early start to the west farm and to go to the Custer sale. he was gone all day and bought two young cows. I had Agnes wash the white clothes and I put some in the garret and some to soak. It rained all day. Thursday October 16th 1890 We put the clothes out this morning and ironed those in the garret. I went to town in the afternoon. John is better. Mother did not come home tonight. Will did not go back to town. Friday October 17th 1890 It was a delightful day. Will hauled straw in the forenoon. I got the ironing and other work done and when Mother came just before noon to get the dinner. I went to town to order goods and stayed at Hatties till three oclock. Fanny brought me home and took Mother back. She came home to stay all night though. I was sewing some what spare time I had. We had a letter from Lizzie Duncan. Maggie is home and very near death. Saturday October 18th 1890 There was a change in the weather since yesterday. It was cold windy and cloudy today. We got the Saturday work done in the morning and Will took me over to spend the afternoon in town. Mother came over to stay all night. The boys are having a great game of foot-ball with the Grinnell boys. Will did not go back to town. Sunday October 19th 1890 I was busy about the work all the forenoon. Agnes went home after dinner she could not stay any longer. Will and I went over to Marys to spend the afternoon. Mother came home before supper. we spent the evening reading. Monday October 20th 1890 I began work on my black knit jacket. The new girl (Annie) came in the forenoon. Lee came home today. We washed in the afternoon and the clothes got dry I worked what time I had on my jacket. Mother was in town in the afternoon. John is getting better.